The 34,000 square-foot Lyndhurst mansion, sprawled across 30 acres in Riverview, was home to the John T. Lupton family. The Lyndhurst mansion in Riverview once stood as one of the largest and most elegant in the area. Its story began over a century ago. Many patent medicines were concocted after the Civil War, and one in particular made out of kola nuts and coca leaves took off. A young attorney and entrepreneur, John Lupton, who was treasurer of the Chattanooga Medicine Co., befriended two fellow Chattanooga attorneys, Benjamin Thomas and Thomas Whitehead, who had the idea for widespread bottling of this emerging beverage. Lupton had the foresight and the capital to bottle and distribute what became one of the world's best known consumer products, Coca-Cola. His funding came from activities in real estate and his involvement in the Chattanooga Medicine Co., which was prospering from its own Wine of Cardui and Black Draught potions. 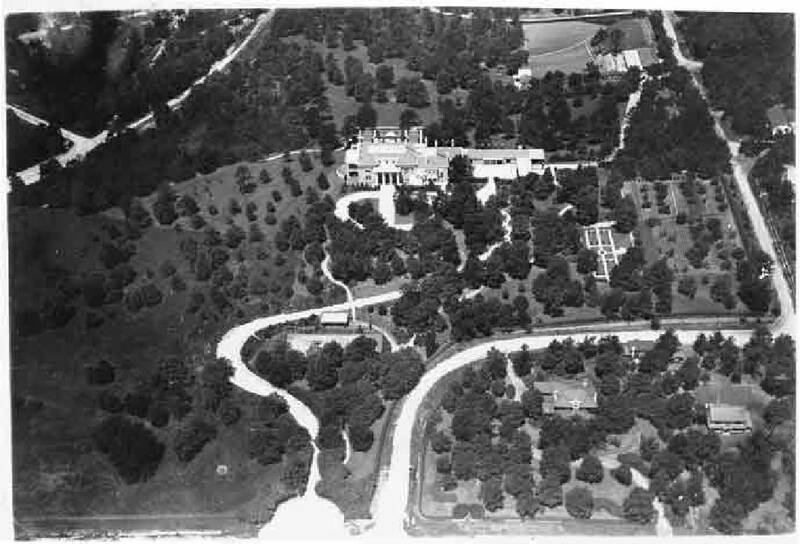 The fruits of Lupton's success were directed in 1910 into a grand home on 30 acres surrounded by Hixson Pike as well as Riverview, Hillcrest, Lexington and Dorchester roads. Many thought that only the Biltmore mansion in Asheville, N.C., was grander. The Lyndhurst mansion was named after a picturesque village in the south of England that the Luptons enjoyed visiting. Their new home on gently rolling land overlooked a broad sweep of the Tennessee River. Cream-colored brick and terra cotta accompanied an imposing facade in front of 34,000 square feet of living space divided into more than 30 rooms. The visitor entered Lyndhurst through a long corridor lighted by carved clusters of candles and a large group of lights from a dome over the middle entrance. Great mahogany bookcases lined the walls of the library and surrounded a frieze depicting the Lady of the Lake. The living room with its open fireplace and large mahogany table had wide doors that opened onto an enclosed porch with ferns, palms, and furniture overlooking formal gardens and a miniature lake. Each bedroom on the second floor depicted a period of English history. The large ballroom had a pipe organ. Jack Lupton, the grandson, was quoted in a Chattanooga News-Free Press article as saying "it had absolutely everything, ballroom, indoor swimming pool, bowling alley, gymnasium, elevator and millions of rooms." His grandfather's heart condition was thought the reason for athletic facilities. Lyndhurst was in the pre-Depression years the center of social life in Chattanooga, when entertaining was done on a grand scale. Jack's grandmother, Elizabeth Patten Lupton, presided. Family members gathered at Lyndhurst, and several including Jack's parents (Cartter and Margaret Ann Rawlings) lived there until after the youngster was born in 1926. Jack concluded that the mansion was terribly overwhelming but a good place to play and roam. As soon as Lyndhurst became a fixture in Riverview, it began to fade. John Lupton passed away in 1933 and his wife Elizabeth in 1941. Cartter, their only child, had built his own mansion close by and left to serve in World War II. Jack's sister, Elizabeth, said her family kept a Victory Garden and animals during the war, and it was her job to bring in eggs every morning. Lyndhurst became increasingly difficult to maintain. The family kept the heat on at the shuttered abode, but the roof began to leak, causing damage to the wooden floors. The Luptons decided against donating the mansion to a hospital or other public organization in order to preserve the private character of the property. In 1960, Cartter Lupton approached developer Tommy Lupton, his cousin, and they agreed on a plan to raze the structure and develop 15 one-acre lots in a first-class subdivision. Tommy noted the demolition of Lyndhurst's 18-inch walls required as many as five rounds of dynamite. After each explosion, somebody in the demolition crew must have shouted, "What a blast!" The magnificent structure vanished with hardly a trace. Today a beautiful group of homes sit on the Lyndhurst site. As another part of its legacy, the Lupton family through the Lyndhurst Foundation and private philanthropy have helped make Chattanooga special. Frank "Mickey" Robbins is an investment adviser with Patten and Patten. For more visit Chattahistoricalassoc.org.